This outfit was inspired by a photo I recently saw and pinned on Pinterest. 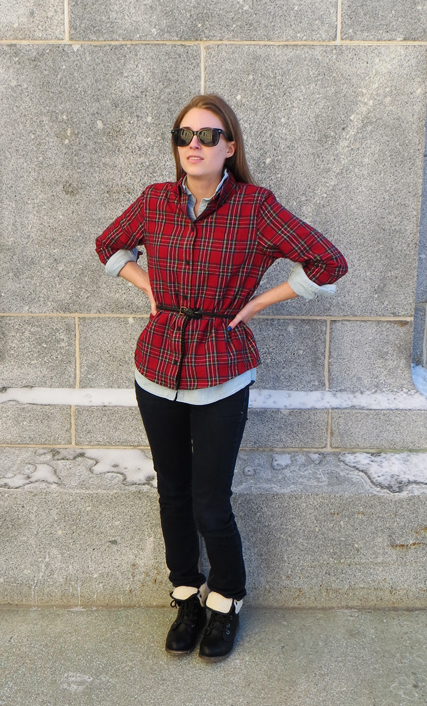 I loved the idea of layering a flannel shirt over chambray! I added the belt because I felt like a box without it (my flannel isn't tapered at the waist at all). I love this look and might try it again with a different plaid shirt and different shoes. And possibly different pants. I'm getting QUITE sick of the way these jeans fit me. The search for perfectly fitting, not-too-stretchy jeans continues!